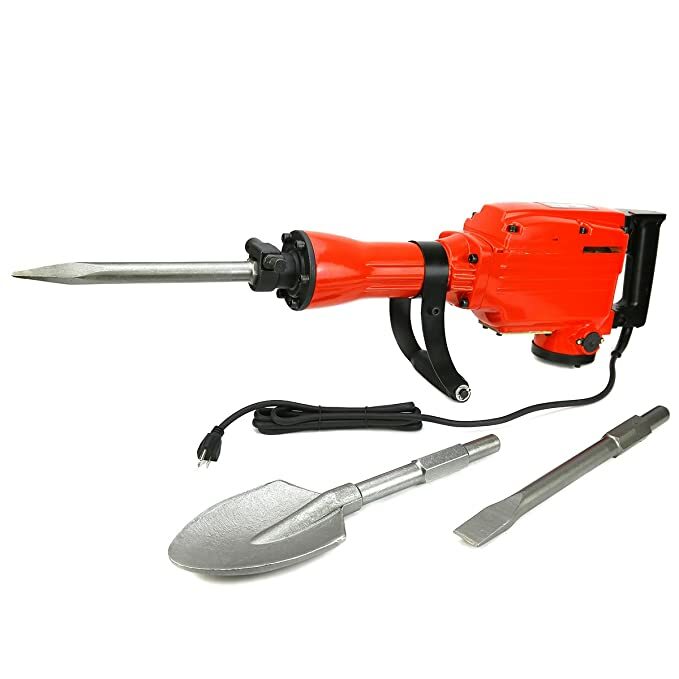 Demolition hammers work like a normal jackhammer that you would see being used outside but are smaller and easier to carry, often powered by an electrical outlet. The products below are evaluated for their durability and ease of operation. Once you’re finished with the reviews, remember to check out the brief but informative tips in the Buyer’s Guide. The Bosch 11316EVS SDS-Max starts off the list with a bang, having a jungle green plastic exterior that’s compact and sturdy to carry around. The handle grips are also nice, strong enough to keep your hands on them with little slipping. Size remains medium, whereby it’s larger than models that would not be recommended for tile floors but smaller than those which wouldn’t be used either. You can change through the bits very fast. There’s a bit locking mechanism that basically hooks on to your accessories for you as they are placed in the front of the device. While it would have been nice to have something included, it shouldn’t be a huge issue to buy additional parts for you to get started. The weight is light, and holding it won’t leave you tired early in your duties. That means you can have an average sized kitchen or bathroom completed and ready for new tile in a relatively short amount of time. A day’s worth of work might be necessary, but even if you prefer to take your time, hamming away at your old tile will go by without leaving you with a headache. The only drawback is with the plastic exterior. It’s solid but takes on scratches and dents pretty quick, so be sure that you’re handling with care and storing properly when the tool isn’t being used. If you can do that, then the Bosch 11316EVS SDS-Max is definitely one of the best all-around hammers you’ll find anywhere, both online or in brick-and-mortar stores. 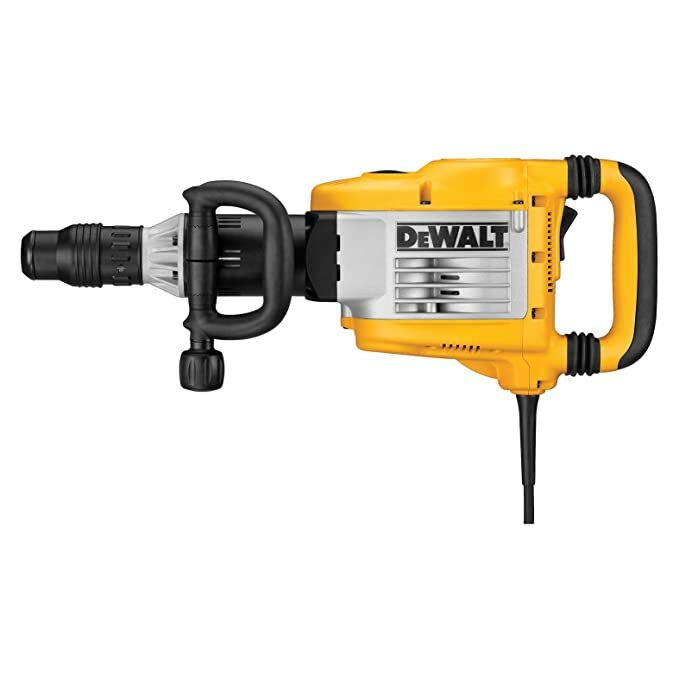 Dewalt makes lots of different tools and tool sets for literally any construction job you can think of. They are particularly famous for their power drills. But the brand also makes great quality hammers. The D25901K SDS Max is a yellow colored piece that has great handling and cushioning power. If you’re worried about getting your hands injured or sore from vibration (a common problem that happens with some hammers), this is the right tool for your tile floor. Inspection of the product shows a rear handle that has two flexible pieces close to the area where your hand would be. This is to minimize shock when it’s on. It also helps you keep the hammer stable on high settings. And there’s also power itself, with the device having 19 settings in total to switch through. The oldest and toughest of floors will come up without requiring additional tools for the job, save the chisels you’ll have to get separately. Stalling is known to happen with this product. It tends to occur when on high, so keep this in mind before you make your final choice. And as mentioned, there are no bits sold alongside the hammer itself, so be sure that you’re getting pieces you know are needed for the work you intend on completing. Many of the best tools often won’t have the auxiliary portions of a machine, requiring that the users obtain the rest themselves. Anyhow, that doesn’t take away from the D25901K SDS Max’s ability to plow through tile floors in an efficient manner. The third and final product is the XtremepowerUS Jackhammer, an all-in-one set that includes everything needed for you to replace tile in your home. If you don’t want to buy anything bits, this should suffice. Three bits are available with the main tool which includes a flat and bull point chisel. The scoop shovel may also come in handy, especially if you intend on using the hammer for outside work. It’s great for beginners, having easy to follow controls that are simple to adjust. Weight distribution remains even, which would greatly help in areas that aren’t flat. Just be careful with the handles. They might wear down over time, especially if you’re using the machine to work jobs on a daily basis. And it’s pretty heavy, so while it’s a good buy for anyone that doesn’t have a lot of experience with these tools, getting used to the weight could shy away from some potential buyers. And oil leakage is a common occurrence. Try to keep all parts clean when you’re finished, taking the time to spot any damage parts that are close to the motor. While the XtremepowerUS tool might not be perfect, it will get your tiles removed at the same rate as any other hammering product. For that alone, it deserves consideration and will get you through lots of work if general upkeep is performed. Any power tool requires that the user know a little about the device before they settle on any given product. Here’s a few things to consider before you settle on one of those shown above. Jackhammers are notorious for being heavy and bulky to carry around. Anything that’s lightweight will always be preferred over those which contain parts that make it difficult to move around, whether it be during or before/after work has finished. A good hammer for tile will have a weight between 20 to 60 pounds, which incorporates most medium sized products sold to consumers in this category. If you’re a large individual, higher weights might be easier to handle. But smaller models could be better suited for a larger group of people since carrying the piece isn’t a chore in itself. Basically, the lighter the hammer, the better it will be for you. Hammers aren’t always the complete package. This means you could purchase a tool that doesn’t include all the parts needed for you to start demolition. Most tile floors require that at least one chisel be used. Flat chisels are best, but bull points and shovels would also go a long way in getting your work completed without error. Make sure to check if the product you’re interested in has these accessories included, or whether they don’t. This could be more of an issue that’s dependent on the region you live in. For instance, some places may not have power cables that are compatible with 220-volt outlets. It also determines the amount of power the machine is able to output during hammering. But higher wattage doesn’t always equate to a better hammer. Find out the wattage of the product you like and compare it to the workload you plan on demolishing. Large floors could be better with a more powerful motor. But it’s still a factor that’s heavily dependent on the user’s preferences. While there aren’t many products to review on the list above, the one that comes out on top is probably obvious already. 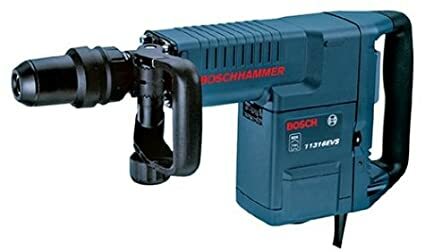 It’s the Bosch 11316EVS SDS-Max, chosen for its lightweight construction and fast hammering speed. But don’t forget about the others shown on the list as well, which could be just as beneficial to the job you have lined up for yourself. All three shown good power and speed/adjustment options, and they remain relatively easy to handle. In short, whichever hammer you end up with, you’re sure to have a good tool that can have you ready for a new floor install in no time.